Just two trading days into the new year, shares of Tesla were already down nearly 10 percent. According to Vertical Research Group's Gordon Johnson, this is only the tip of the iceberg for what's to come. 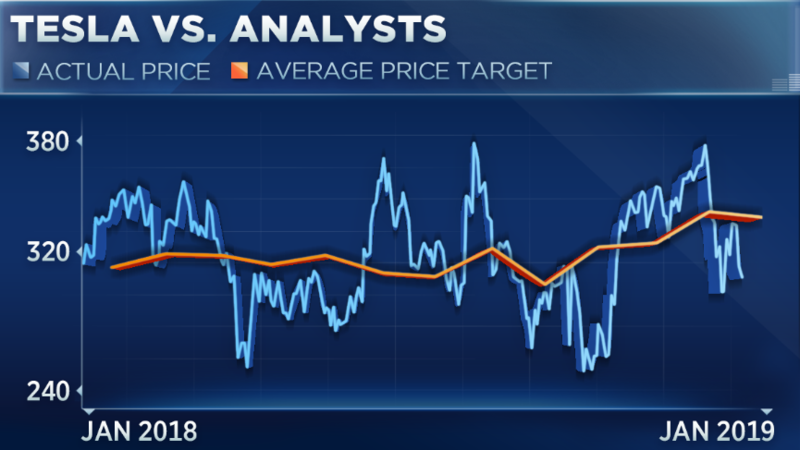 Johnson has an $88 year-end price target on the stock, which means he believes the automaker will lose 70 percent of its value in the coming year. For perspective, the average analyst price target for the stock is $334, according to FactSet. "If you take the Q3 numbers and you annualize them, I think Q3 is going to be the high-water mark for Tesla. I don't think they're ever going to reach that level of earnings again," he said Thursday on CNBC's "Trading Nation." "If you look at what the stock's trading at, you're talking about like you know near a 100 times multiple on those earnings, and the company is clearly not growing at that level." The "high water" mark that Johnson is referring to is Q3 results, reported in October, when the company topped car delivery estimates and posted a surprise profit. 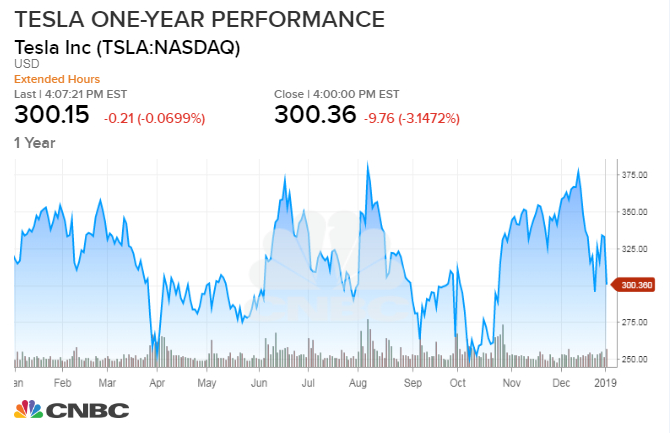 Tesla finished October with a gain of more than 27 percent — its best month in more than 4½ years. But what a difference a quarter makes. On Wednesday shares fell as much as 10 percent after the company missed Q4 delivery estimates and announced a $2,000 price cut on all of its models to help offset a reduction in federal tax credits for drivers who buy electric vehicles. The $7,500 federal tax credit for Tesla cars was cut in half as of Tuesday. The selling was abated on Friday morning following reports the company would begin delivering its Model 3 to China in March. Tesla bulls have long believed that if the company could ramp up production, there would always be buyers lining up for the cars. But Johnson argues that the demand just isn't there, and that increasing competition as well as a reduction in government subsidies will steer consumers in alternate directions. "They've been unchallenged up until now, essentially. They don't have real competition coming in until the second half of '19. ... Tesla's incentive is being cut in half and I think you're going to have a huge falloff of sales in the first quarter." Because Tesla sells its cars directly to consumers rather than going through the traditional dealership approach, Johnson argues there could be some discrepancies in how its inventory is being reported. He also believes there will be massive cancellations after the government subsidy for electric vehicles was slashed in half. "I think you're going to have huge cancellations. We believe roughly 155,000 ... that's a big deal. We think they fully exhausted their US backlog and we think you're going to see that in 1Q. We don't think it's going to be like a 10-15 percent falloff in sales. We think it's going to be astronomically higher than that, and I think it will shock people to the downside." Finally, he believes the company's AI software, which many have regarded as ahead of its peers, is actually not best-in-class. Johnson thinks that after recent high-profile crashes, consumers will be tempted to look elsewhere. The confluence of all of these factors leads Johnson to believe that the stock's more than 22 percent slide from its 52-week intraday high of $387.46, hit in August is just the beginning of a steeper sell-off. "While there is some risk on the 4Q18 print, we would be aggressively shorting TSLA now as the growth narrative appears at risk ... even for the bulls," he wrote Thursday in a note to clients. To be fair, Gordon has predicted a massive decline for Tesla for some months now, but he is more convinced than ever that it will happen sooner than Wall Street expects. When asked for comment, a Tesla spokesperson referred CNBC to the company's recent production update. In that deliveries and production release, Tesla said opportunities to expand Model 3 sales exist in international markets, including Europe and China, while deliveries in 2018 totaled more than in any of its previous years combined. The company also said it had nearly tripled its delivery run rate last year.